Babies love to rock. According to research into the brains perception of sensory input, forward movement is the most comfortable and soothing type of motion for a baby. Think of rocking on a swing. The brain perceives this rhythmic forward swinging as a linear, soothing motion. 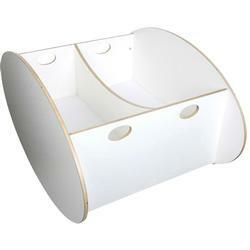 The so-ro cradle provides the type of motion most comfortable for babies. Its front-to-back rocking motion has a soothing effect that helps babies fall asleep. In turn, you may find yourself a calmer, better-rested parent with more energy for everyday things. With three grades of elevation at the head, the so-ro crib helps to maintain a clear, unobstructed environment around the infant’s head. This promotes healthy breathing, and is especially helpful for infants with colds or stuffy noses. The so-ro cribs mattress is 1 inch (2.5 cm), the American ASTM standard for infant mattress sizes. This eliminates the indentation on the mattress usually caused by the weight of the infants head. It is recommended that the infant sleeps without a pillow. The so-ro cradle’s design makes it suitable for the bedroom at night and for the living room during the day. 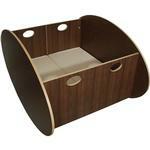 As for all cradles, it is suitable for use from birth until the infant is crawling (usually from 0 to 6 months). The so-ro cradle rocks in a gentle and stable manner, with very little effort. The cradle can be turned over only when one end is lifted up. An adult can stand in the cradle without tipping the cradle over.